I am going to try different recipes for homemade tortillas before my extended trip to Mexico. 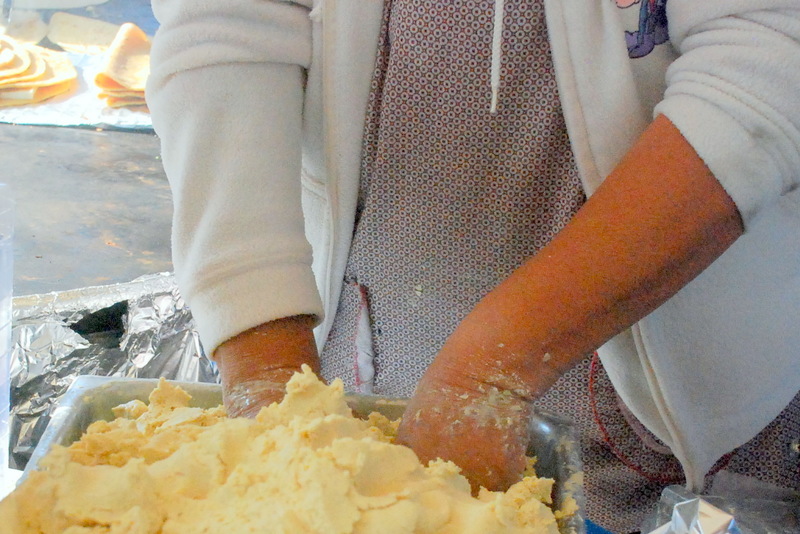 In fact, I’m up to my wrists in dough like the tortilla maker at Maxwell Street this past weekend. Without a tortilla press, I followed this recipe to the letter and rolled them out with my rolling pin. Other than looking a little strange, these tasted really good. I used shortening instead of lard. I will try lard this week and let you know which one I like better. I took a few of them up to the Mexican grocery store La Union in Highwood and asked the owner Hilda. She was impressed with my first effort and also talked me into buying a Comal to cook them. From Chihuahua, Hilda grew up eating flour not corn tortillas and she told me that you press corn tortillas and roll the flour. That was something I never knew. You roll out the flour dough like you do a pie. Can I use a press on flour tortillas? Not sure why but I’ll ask her this week when I bring in the ones made with lard. Does homemade make a difference? Just take one bite and let me know if you can tell the difference. I can. Before, all I was interested in was the eating. I am still interested in that but I’m focused now on how Mexican cooks master their techniques. It all starts with a simple tortilla. Add spoonfuls of lard or shortening. Use a pastry cutter to cut mixture until it resembles crumbs. Pour in the hot water very slowly, stirring to bring together. Knead dough approximately 40 times until it becomes a solid ball of dough and is not so sticky. Heat a dark or cast iron grill to medium/medium-high heat. One by one, roll balls out until paper- thin. Cook on each side for 30 seconds and remove while the tortillas are still soft but have slightly brown spots.